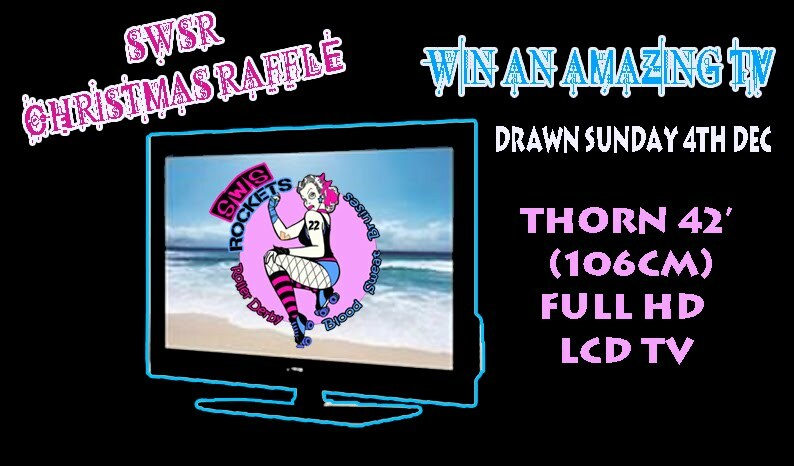 Thanks to our sponsor Radio rentals SWSR will be raffling and amazing Thorn 47’ inch (106cm) Full HD LCD Television, it will be drawn at half time and you can pre purchase tickets for these from www.swsrollers.com. PLUS come dressed as your fav “Nightmare before Christmas” inspired gear and you’ll be in the running for some great prizes. 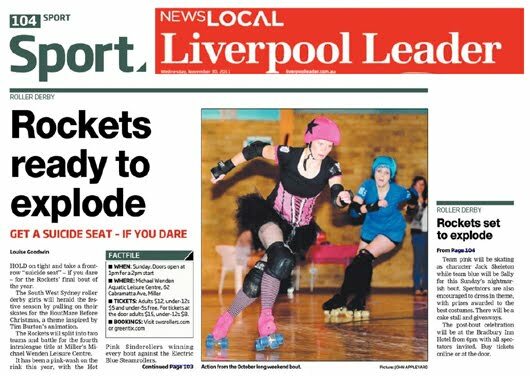 SWSR are excited to be participating in our last bout of the year and were asked to participate in a story and photo-shoot for Liverpool City Champion, to promote our bout, being held at Miller, The Michael Wenden Leisure Centre. The Rockets are ready to explode, so be sure to get in early to get your ticket as this bout is sure to sell out. Hundreds of SWSR fans packed to the Wenden for the last bout in October and took advantage of the suicide seating; the best seat in the house. You can get up close to your fav derby girls, if your lucky one might land in your lap ! Check out the online edition of this weeks Liverpool leader to see the story close up ! 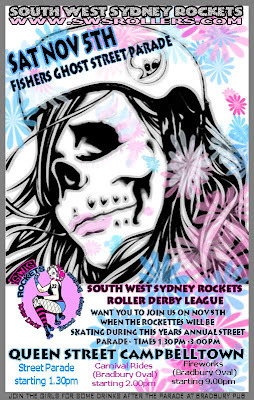 SWSR’S LAST INTRALEAGUE BOUT OF THE SEASON BOUTMARE BEFORE CHRISTMAS South West Sydney rockets proudly presents for the final time this season, SWSRS Intraleague bout “Bout Mare Before Christmas“; The South West Sydney Rockets will be celebrating Christmas this year the best way they know how, with skates ! Hosting a Tim Burton inspired “Bout Mare Before Christmas”. 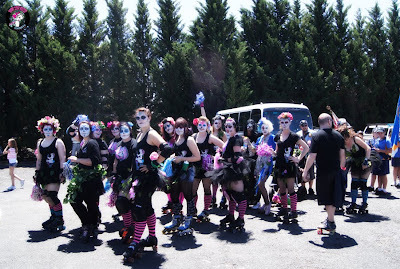 This years final intraleague bout will see the Sinderollers skating as “Jack Skeleton” and The Electric Blues as the ever shy “Sally”. 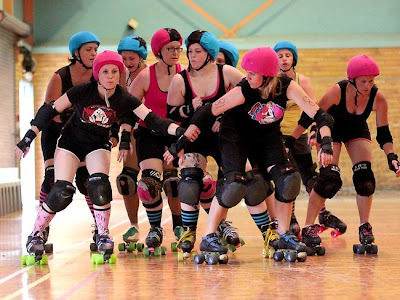 The Sinderollers are sure proving to be the dominant force this seasons, but with skaters our due to injury and rosters being mixed around, will team Pink be able to hold reign. 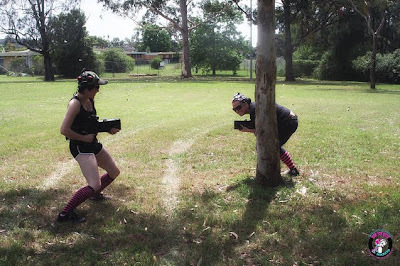 The Sinderollers have won the last three bouts played, but The Electric Blues have every chance of finding there spark and take out Bout 4 of 4. You will have to be there to witness this monumentous bout, where the Electric Blues will be fighting to the bitter in to win one bout this season. 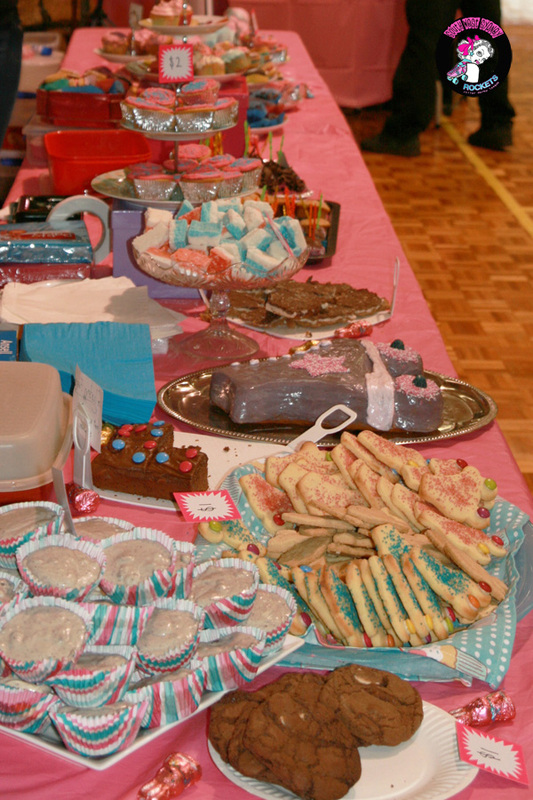 The famous SWSR cake stall will also be back better than ever. If you haven’t tried the incredible Rocket Rainbow Cake; then that should be enough to entice you to the bout.. While you are there, grab some SWSR merch. There will be shirts, stickers, jewellery and accessories that will be perfect to stuff any derby fans Christmas stocking. The Macarthur Advertiser showed some spectacular images of SWSR during there highlighted coverage of the Fishers Ghost Parade this year, in Black, Pink and Blue, the Rockettes gracefully rolled and rocked out our intricate makeup in the sun.. we cant wait to do it all over again next year ! 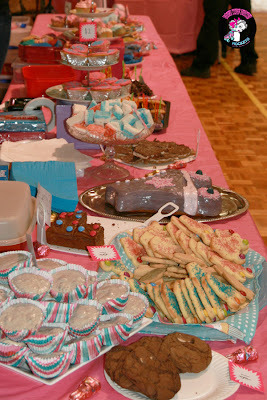 For even more images be sure to check out the Macarthur Advertisers online Gallery of this fun filled family event. 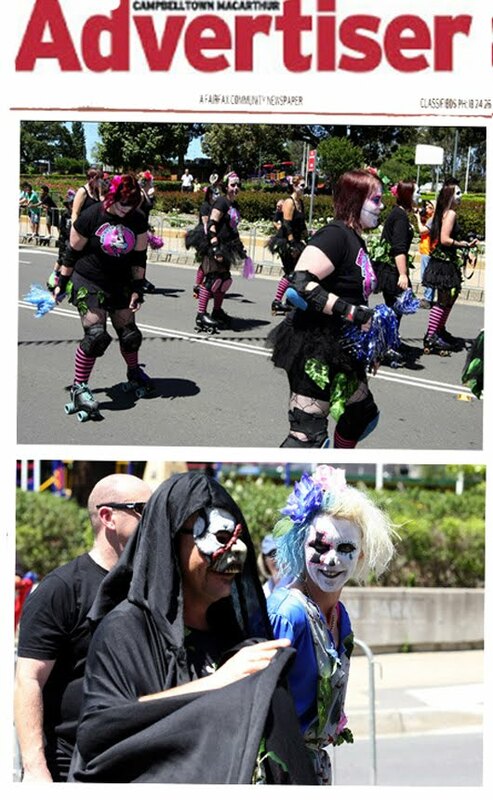 The SWSR Rockettes packed on some gorgeous makeup and costumes, to skate along Queen street for the infamous annual Fishers Ghost Parade, as part of the Fishers Ghost Festival celebrations. 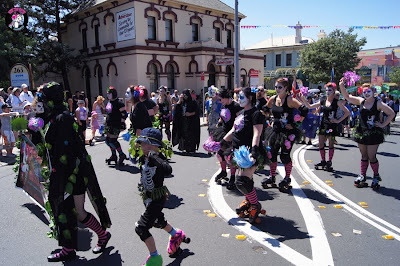 Hundreds of locals packed to the sides of the streets to take part and watch the many colorful floats, displays, people AND Derby Girls making there way along the street as they do every year ! South West Sydney Rockets had an amazing day at one of our most frequent training venues The Michael Wenden Leisure Centre. The day was filled with Sun, Water, Games, Rides and Derby Girls ! With the Rockettes Rolling around, dipping our toes in the water and participating in the fun family info day at the Leisure centre located near Liverpool. Click on the link below to view our flickr album for a complete set of photos of the SWSR Girl out in action on the day. 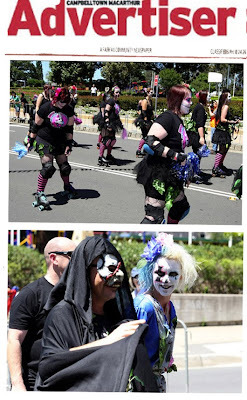 This year South West Sydney Rockets had an amazing day of fun in the sun at this years Annual Fishers Ghost Street Parade festival held in Campbelltown this year. 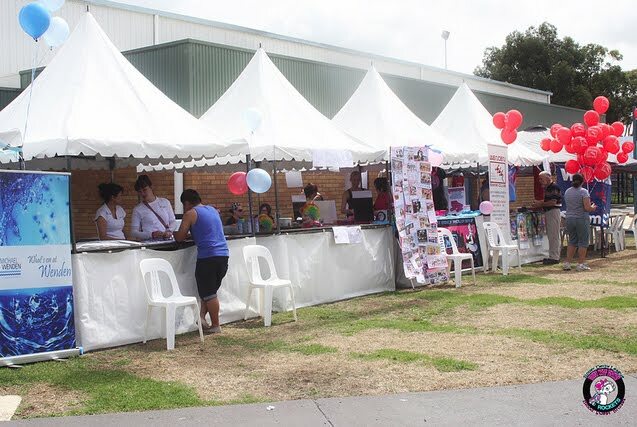 For those of you who don’t know, Campbelltown has been celebration the Ghost of Fred Fisher in there Annual Festival for more than 50 years. Almost four months after the mysterious disappearance of local farmer, Fred Fisher, in 1826 a strange occurrence took place in a local hotel. On that memorable night, a wealthy and respectable farmer, John Farley, stumbled into a local hotel in a state of shock claiming he had seen the ghost of Fred Fisher sitting on the rail of a bridge over a creek. The ghost pointed to a paddock down the creek then faded away. The body of Fred Fisher was later discovered in the paddock where the ghost had pointed and more than 100 years on Campbelltown still celebrates this tragic murder, neighbor George Worrall confessed to the murder during trial, and some say the ghost of Fred can still be seen sometimes sitting on the rail of the bridge overlooking the creek. The Festival is celebrated every year with locals and visitors enjoying the attractions of the street parade, fireworks display carnival rides, sporting demos and music concerts, the two week event was a huge success this year and SWSR had an a great day out, celebrating after with drinks at our faviourtie drinking hole and sponsor "Bradbury Inn Hotel"
at the Michael Wenden leisure Centre Open Day ON NOVEMBER 12TH!! SWSR will be there between 10am and 3pm with an information booth and merch. 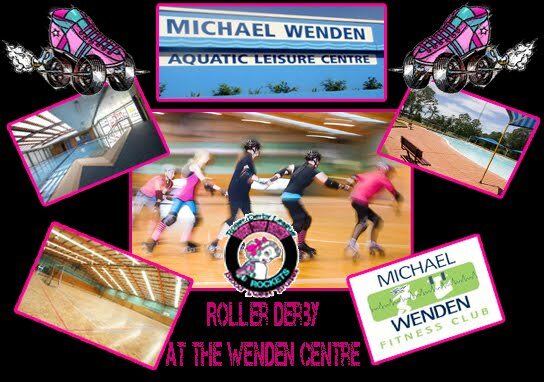 Entry is FREE so come down with the whole family for a day of fun at Wenden! 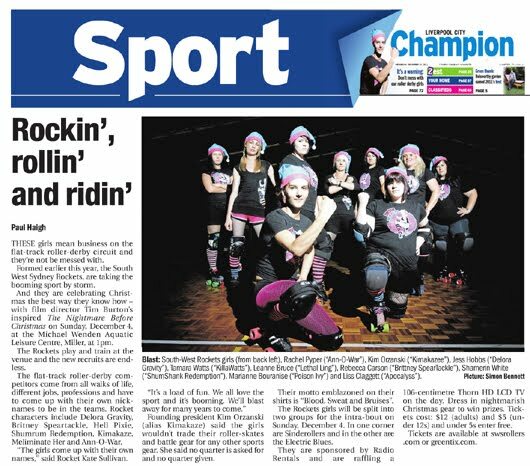 AND THE SWSR ROLLER DERBY GIRLS !! 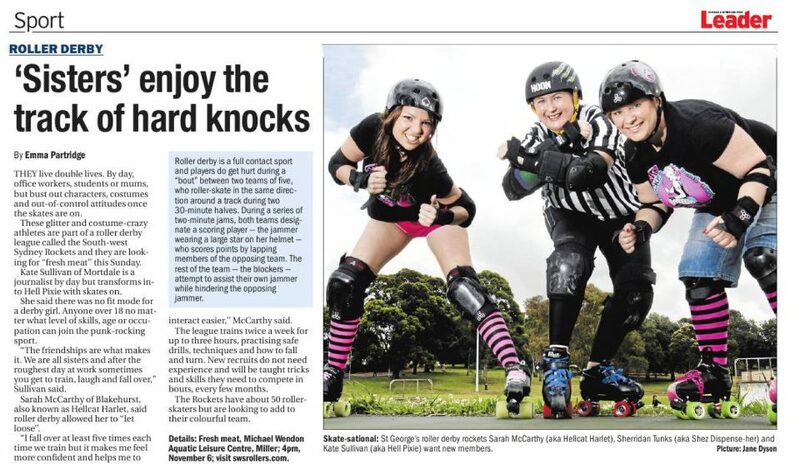 We hope to see everyone who is interested in roller derby to come down and have a look, talk to the girls, and perhaps sign up to our next fresh meat intake ! for more information, click HERE to be taken to the Wenden's Website ! 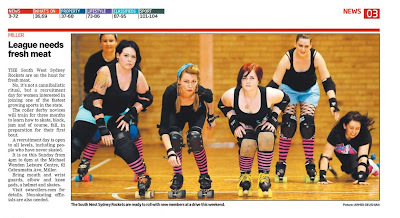 SWSR IN THE DAILY TELEGRAPH !! Did you get your dose of 'The Daily Telegraph" this morning? 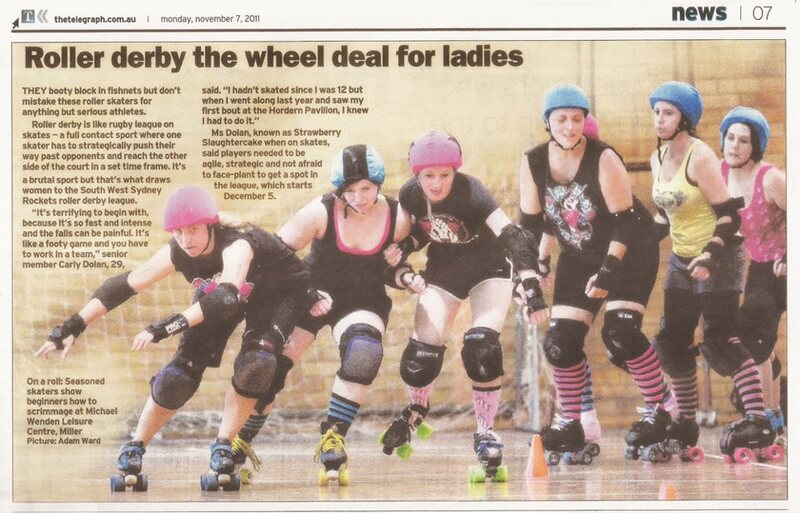 If you havnt yet.. make sure you do, and check out the girls of SWSR on page Five !! SWSR were also lucky enough to get a video and interview on the Daily Telegraphs multi media feature on there website. 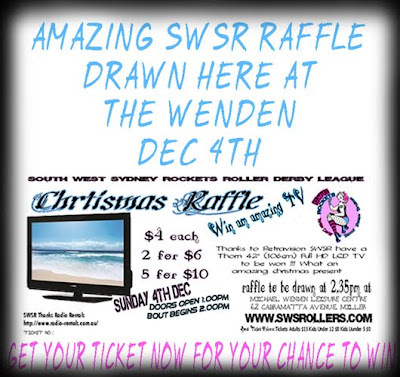 SWS Rockets with the support of Radio-Rentals are holding a fundraiser Christmas Raffle !! What you will win !! 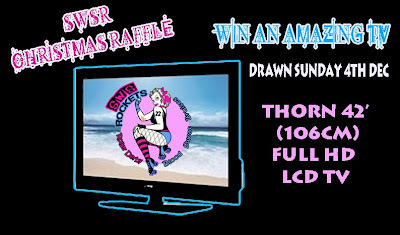 42' Thorn (106cm) Full HD LCD TV !! SWSR GETS FRONT PAGE !!! OHHH YEAH!! SWSR were thrilled to wake up this morning and see ourselves on the FRONT PAGE of the Macarthur Advertiser !! AND also on PAGE 5 !! 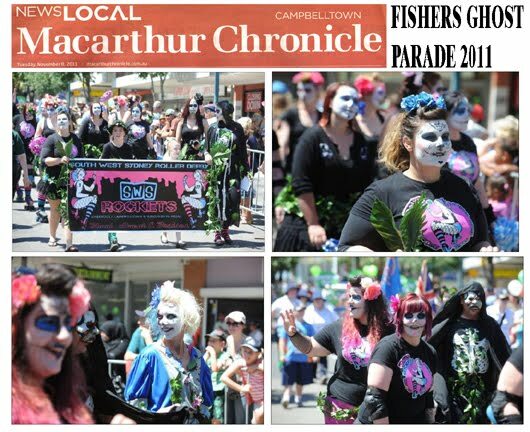 Excited about our win and 2nd placings during the fishers ghost parade last year, we were lucky to have a write up about our involvement in this years parade !! Looking forward to seeing everyone on Saturday during the festivities; cheering us on ! AND BE THERE THIS WEEKEND BE THERE !! 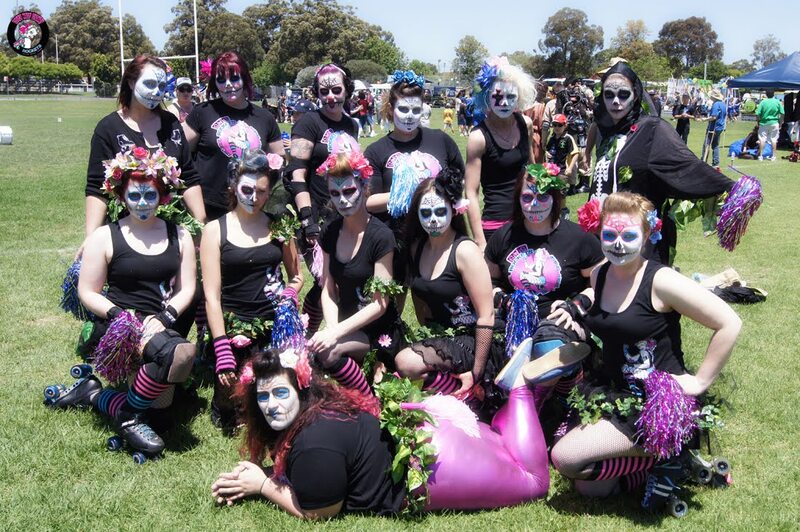 SWSR will be a group not to missed, as promised we will be dressed in theme (Green, nature, leaves) and will be showcasing some impressive Day of the Dead makeup, in Black Hot Pink Blue and on skates, be sure to come down to Queen Street to cheer us on ! Queen street, Campbelltown, check the Fishers Ghost website for all times and parking details ! 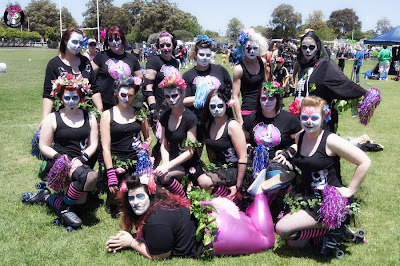 Its that time of year again and SWSR are excited to be taking part in this years annual Fishers Ghost Street parade !! "WINNER of the Best Sports Team" Categories. AND SWSR WANT YOU TO PARTICIPATE IN SOME FAMILY FUN THIS YEARS FISHERS GHOST PARADE IS ABOUT TO ARRIVE SWSR Are getting ready to Roll down Queen street for the second time !! After an exciting parade in 2010, in which SWSR were lucky enough to secure three placing’s in the community and sporting categories on display at last years annual Fishers Ghost street parade festival. This year SWSR are hoping it is no different, and are eagerly awaiting November 5th to participate in tis years Fishers Ghost Parade. Win, Place or Lose, SWSR are just excited about participating in this family fun event which is held every year by Campbelltown Council. 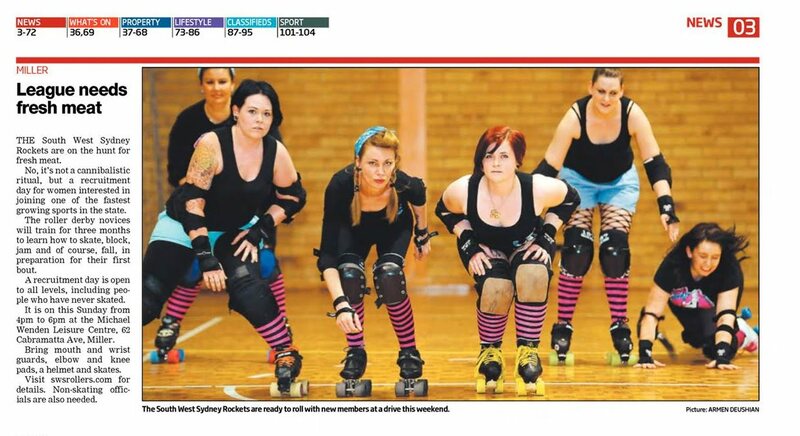 With most members of SWSR being Campbelltown locals, this event is sure to bring every out to watch. Rain, hail or Shine, be sure to get yourself down to Queen Street, to participate in the fun. Bradbury Oval will have the usual carnival rides and fireworks, with a skate park demo, local bands and much more. So what are you waiting for? Get yourself down to the Fishers Ghost Festival, see SWSR skate in the parade, and then celebrate with us afterwards at The Bradbury Inn, proud sponsors of SWSR ! 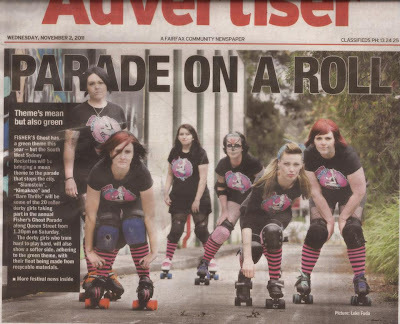 The ladies will be enjoying themselves at Bradbury Pub after thae parade for some drink, so come down and say hello and support the girls, Bradbury pub and Campbelltown !! Tickets for sale now !! 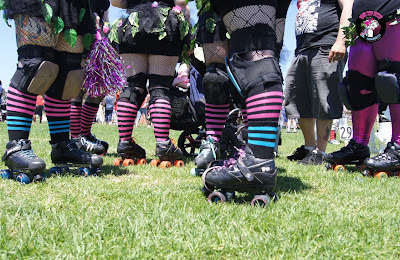 AFTER CELEBRATIONS: Derby Girls, Live Music, Great Food, Tasty Beer !! 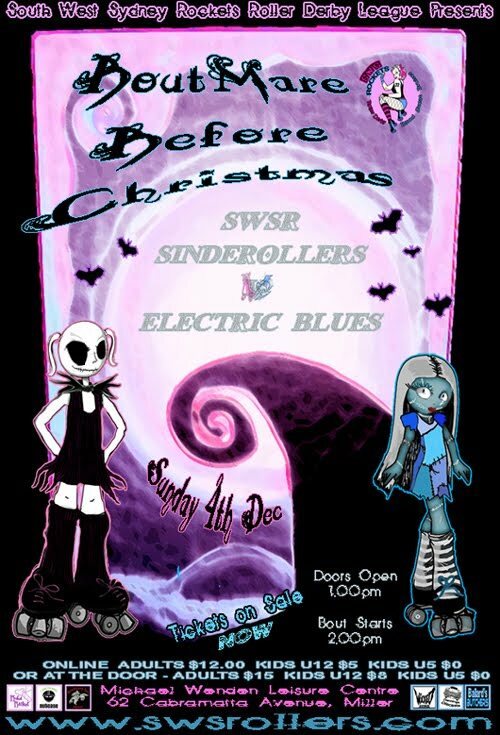 Team Hot Pink :The Sinderollers"
Suicide Seating, Cake Stall, SWSR Merch, Giveaways & More, so come in your best Xmas inspired gear !! and grab yourself a ticket to one of our amazing raffles !!! What better way to spend the afternoon than watching a game of roller derby played by the SWS Rockettes ! We are one of many leagues to hail from NSW, called "South West Sydney Rockets Inc." situated in the Macarthur, Campbelltown / Liverpool / Fairfield areas. 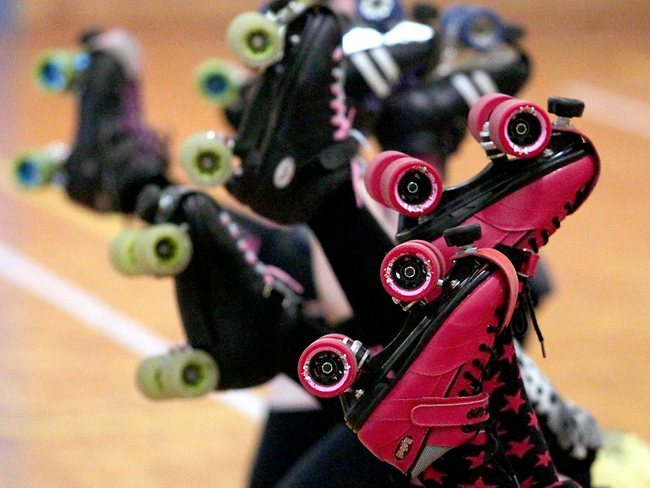 We are a, DIY, skater-owned and -operated flat track roller derby league. 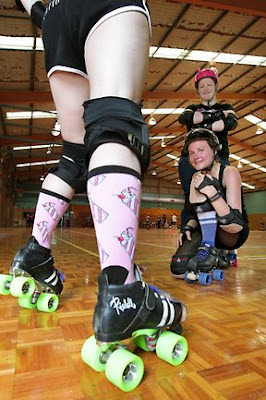 South West Sydney Rockets was formed by a small group of women passionate about roller-skating and the community in April 2010. 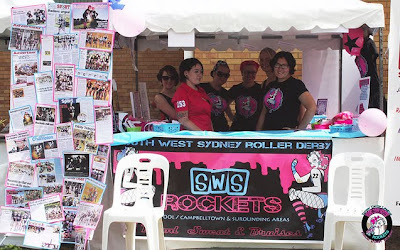 SWS Rockets. Ethereal theme. Powered by Blogger.